Here is a guest article on organic pest control tips for your garden. These organic methods are safe and effective and you do not have to worry about the unpleasant side-effects of toxic chemicals upon yourself and your family, or upon the wider environment. Picture: Marigolds attract pollinators and other beneficial species. Some species are especially good for repelling nematodes. 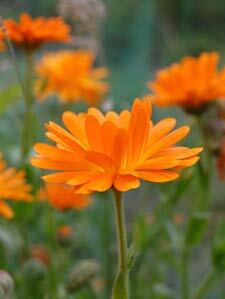 This one is Calendula officinalis. Organic gardening is about balance, and maintaining this balance can be a challenge. There are many gardening tips to help you ensure that your perennial garden stays in constant bloom or stays resilient for years to come, but all successful organic methods will rest on a harmonious interaction of the plants, their soil and the insects that live there. The way you plant your garden can have a big impact on the way it will interact with the critters that surround it. All insects that live in your garden are vital elements in its delicate ecosystem, and any organic pest control program should begin with a calm demeanor and a forgiving hand. When creating a perennial gardening plan, two major principles to keep in mind are diversity and abundance. With an extensive assortment of plants, pests that typically feed on one type will be relegated to one section of the garden instead of spreading across the whole plot. A diverse selection will also attract a welcome variety of good insects to combat the destructive ones. Stick to plants that are suited to your site; those that occur naturally in your hardiness zone* and in your surrounding environment will have a better chance of growing vigorously. There will likely be varying degrees of damage to your organically grown plants, and slightly injured leaves will be able to bounce back to full health if the plant is relatively robust. This does not necessarily mean that every plant in your garden must be robust — in fact, a few weaker specimens can act as sacrifices to the insects, keeping the majority of your plants out of harm’s way. Basically, stressed-out plants will be vulnerable; keeping a medium moisture level and a good mix of sun and shade will help to bolster plant health and provide a tolerable environment for helpful allies. *Hardiness zones for the USA. See http://planthardiness.ars.usda.gov/PHZMWeb/ for your zone if you live in the US. Before you plant, carefully consider the nature of the relationship between different plant species. Companion gardening is the technique of growing specific flowers and plants beside one another to encourage appealing activity; the right neighbors can yield astonishing results for your plants — most notably, strong and pristine growth, and fewer signs of insect damage. Indeed, certain herbs and flowers that produce nectar or pollen will not only look beautiful, but will work in conjunction with the bugs to ensure swift growth. Bees are perhaps the most familiar pollinators, but hoverflies are also wonderful additions to a flowering garden that’s battling pests. While these small black and yellow insects pollinate fruit plants, their larvae feed on aphids that hide in small corners. One step lower on the predatory scale are the minute pirate bugs, ambush bugs and assassin bugs that rely on a versatile diet including spider mites, tomato horn worms, small caterpillars and a variety of insect eggs. Parasitic wasps and lacewing larvae are some of the best weapons against aphid intrusion, while spiders, ladybugs and ground beetles also feed on the pesky bugs that target your flowers. As in every ecosystem, predators are the most important method of population control in an organic garden, and there are a few simple ways to encourage them to visit. Birds, frogs and lizards have an exceptional appetite for annoying insects, and often a small dish of water will attract them to the feast. 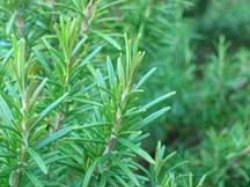 Summon ground beetles to your plot with ground cover like thyme, rosemary or mint, which also provide a protected area for a variety of beneficial insects to lay eggs. To attract the tiny wasps that will take care of your aphid problem, you need plants that produce tiny flowers like fennel, dill or Queen Anne’s Lace. In cases where beneficial creatures fail to control a pest, a few carefully chosen gardening supplies are the best preventative measures for your young and delicate plants. Cutworms are a particularly nasty foe, taking bites out of tender stems near the soil. A collar made from a bottomed-out yogurt container can sit around the base of the plant and protect it from the worms. In the case of slugs, a trap filled with beer will lead them away from your plants. A perennial garden typically requires thoughtful construction and careful soil preparation, but it is the vital interaction of animal life that can make or break the health and beauty of your plants. Your organic garden depends on a balanced ecosystem, which begins with an educated plant choice; a good garden environment will ensure that the beneficial animals will follow, and a good variety of helpful predators will keep everything growing in harmony. I fully agree with these wonderful simple methods for organic pest control. I've had some great results from planting communities of plants in a rich, diverse mix which attract hundreds of beneficial insects such as hoverflies and lacewings. This is one of the most attractive aspects of organic gardening. Everything is just so alive and full of colour and birdsong. The more troublesome pests and diseases are largely lost in the healthy community of complementary plants and insects. I also use a fair amount of companion planting with mixed success, so far. The Complete Guide to Companion Planting: Everything You Need to Know to Make Your Garden Successful (Back-To-Basics Gardening) is a useful work on the subject that is very thorough and detailed. It covers perennials, flowers, herbs and vegetable growing too and it's easy to find your way to relevant information to suit your situation. I also now tend to select seeds and plants for resistance to disease where possible. For more pages on natural pest control and organic methods, see these links below or click on the organic gardening pages from the nav bar. Identifying Weeds - an Easy Guide to Some Common Ones, with Images Excessive numbers of weeds can create good places for bugs to hide. Here's help in identifying them. Designing a Container Garden Container gardens can help with bug control.